Note: Exclusive to The Book People, this is a collection of The Visual Dictionary and Character Encyclopedia in one volume. EXPLORE THE AMAZING UNIVERSE OF DOCTOR WHO WITH THIS COMPREHENSIVE COLLECTION. Learn all about your favourite characters, from the Doctor's deadly enemies to his powerful allies in the Doctor Who: Character Encyclopedia. With stunning images and fascinating facts, discover the incredible worlds that the TARDIS visits in Doctor Who: The Visual Dictionary. 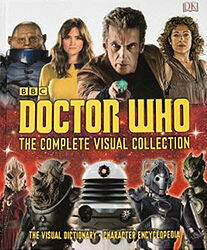 The ultimate compendium for any Doctor Who fan.